After showcasing at this year’s BusVic Maintenance Conference and Bus Expo, Bustech’s double-decker is ready for service at Transit Australia Group’s Surfside operation on the Gold Coast. The decker is expected to run the Tweed Heads to Southport Route 700 service from mid-August, heavily patronised by tourists on the Gold Coast holiday strip. was on the Gold Coast earlier today checking out the double-decker. 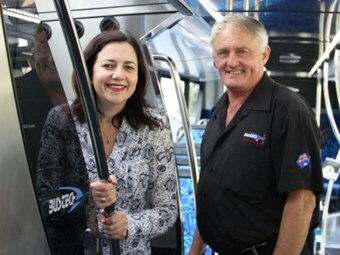 "Gold Coast tourists will be among the first to use this groundbreaking new double-decker bus which will run along the Gold Coast Highway between Tweed Heads and Southport," Palaszczuk says. "The State Government has worked hard to support business and promote tourist growth and it's great we can transport tourists and commuters along the coast in world-class locally-made buses." Transit Australia Group’s Strategic Planning and Delivery General Manager Megan Harkin says Surfside drivers were lining up to drive the double-decker. "We have drivers lining up to be rostered to drive this remarkable vehicle," Harkin says. The Queensland Government, through TransLink, is funding the new double-decker at a cost of about $80,000 a year.